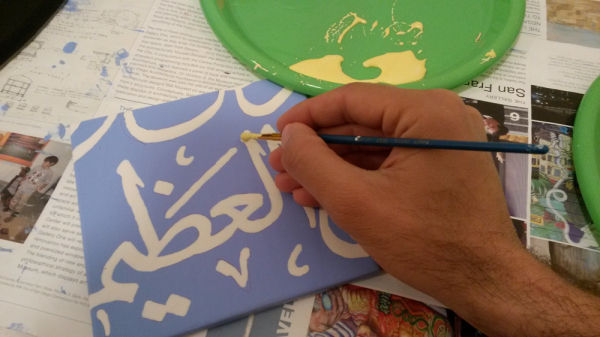 My interdisciplinary art practice includes painting, various undervalued and traditional Arabic-Persian calligraphy scripts, ceramics, mixed media, digital art, time-based and large format, and collaborative projects. Most of these practices and mediums are connected to calligraphy and the way I employ it as a contemporary form of expression. Some of these forms can be viewed on this page. 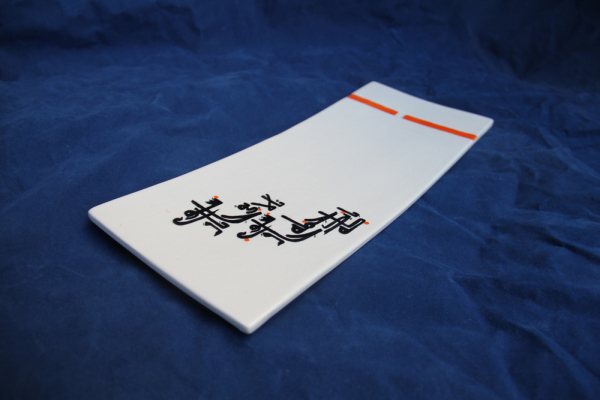 My combination of Kufic script calligraphy and ceramics is inspired by the core essence of Nishapur tradition. Nishapur is one of the very first places in the history of Islamic art, that artists and craft men are using the artistic and aesthetical powers of calligraphy –the Kufic style- in decoration of ceramic vessels; creating a tradition that last for over four centuries. The population of Nishapur was a mix of different cultures from Iranians, Arabs, Turks, Mongols who were subscribed to different faiths; and being at the heart of the Silk Road, merchants and travelers from east and west were adding a lot to the diversity. 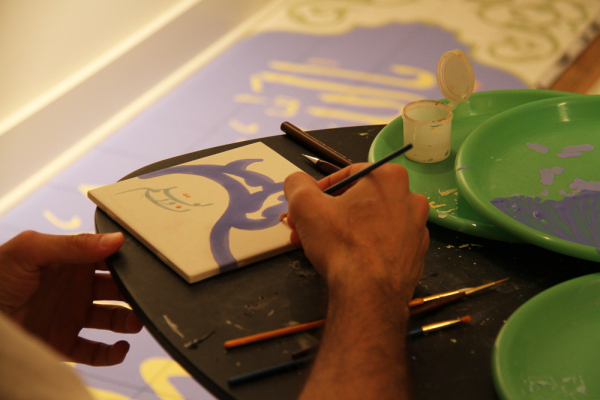 This diversity is reflected in both the content and form of the calligraphic ceramics crafted there. 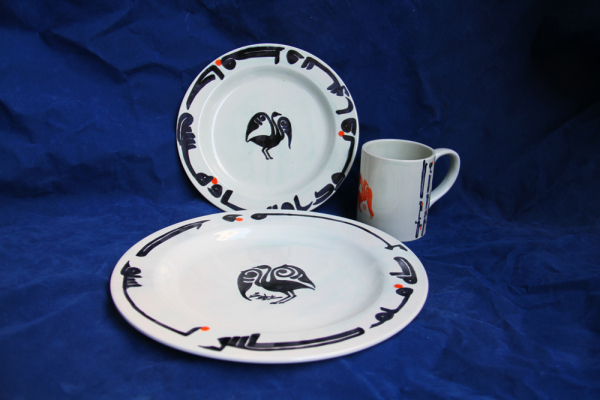 The glazed and unglazed wares became containers of moral maxims, poetry, spiritual sayings, and good wishes which were written in decorated Kufic style. The mystery is what was the function of these very elaborated and beautiful wares? Were they regular wares and dishes people used in day to day life to eat on them? 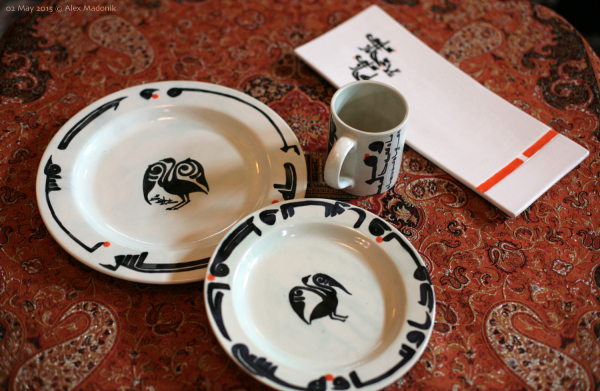 If the food were poured on these dishes then how could they see the beauty and the calligraphic shapes of them? These are the questions that historians of art ask and research on today. One of the appealing answers is that these were functional wares which we can understand from their shape and conditions. The enigmatic calligraphy decorations were actually adding to the ceremony of eating as a remembrance of the sacred life we have: as the user was eating, the calligraphy was starting to reveal itself and its message disclosing gradually, feeding the user both physically and spiritually; The tradition that believes that at every moment of this life we must be present and be aware of the True Beloved1. I have recently got awarded the prestigious Creative Work Fund grant called “To Contain and To Serve: a Dialogue in Calligraphy and Ceramics” to work with an award winning ceramicist Forrest Lesch-Middelton and sponsored by Islamic Cultural Center of Northern California (ICCNC), to create a series of calligraphy-inscribed ceramics inspired by the Persian ‘Nishapur’ tradition revolving around the interplay of hospitality, morality and justice in contemporary cultural and media landscapes. I will be posting the progress in the blog section and the final result by Summer 2016. Traditional calligraphy typically requires a ‘container,’ usually a page, object or building. At its best, the calligraphy inscribed and function of the object were in great harmony, both serving the larger purpose of expanding the awareness of the user or visitor. 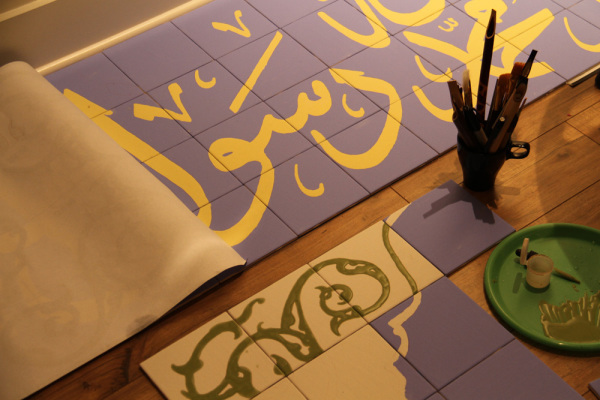 The intertwining of Middle East tradition with calligraphy extends to the modern world where Middle East centers —even in the US—build in calligraphic architectural elements on traditional tiles as the symbolic connection to the culture and spirituality. 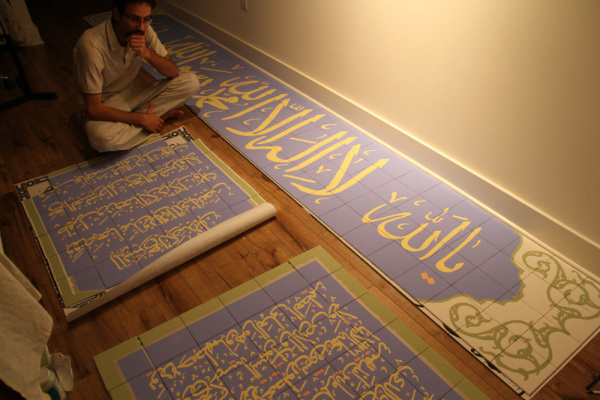 Middle Easterns in the U.S. often gather together in very diverse mixed populations but all sense a shared artistic heritage in Islamic calligraphy. That said, the contemporary practice of the art is just beginning to sprout on U.S. soil, and there’s a need for young and old to see the tradition as not petrified in the past, but organic and emerging into a diverse future. Bearing this fact in mind, Shirinbab has led projects to preserve the traditional art of tile making in California and building hand crafted tiles with geometric patterns, Arabic-Persian calligraphy, and arabesque designs for public architectures. To lead such projects successfully, Shirinbab needed to have a clear understanding of two of the major traditional Islamic arts including tile making and pattern designs from the first hand resources in a traditional society. 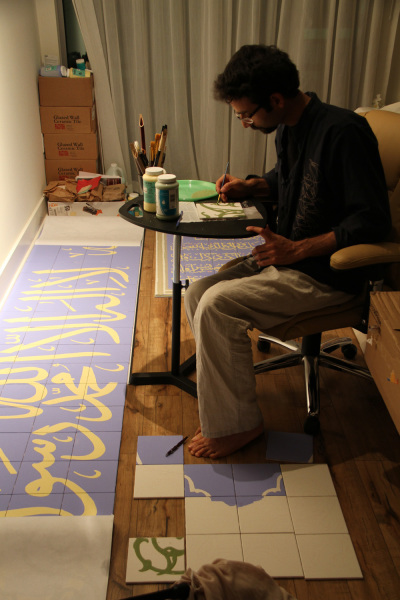 One of the examples of his traditional calligraphy on tile projects was collaboration with the American Muslim Association, founded and registered by Muslim immigrants of Fiji Islands on 2003 in Hayward, CA. 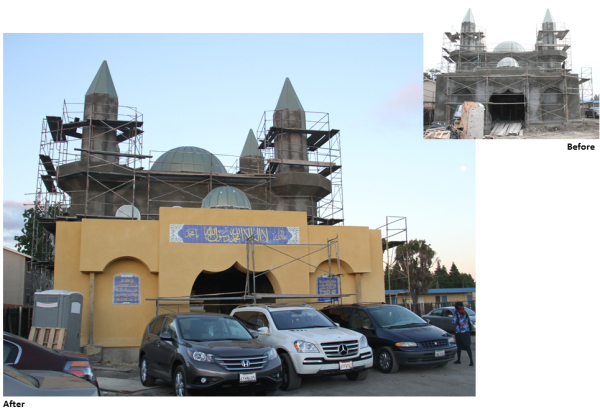 The Fiji’s cultural center they were building is a space which will increasingly foster cross-cultural dialogue and welcoming diverse Muslim and non-Muslim communities to its public programming. They needed to honor roots of Islamic tradition and yet grow a creative common in a changing modern multicultural society they are in. 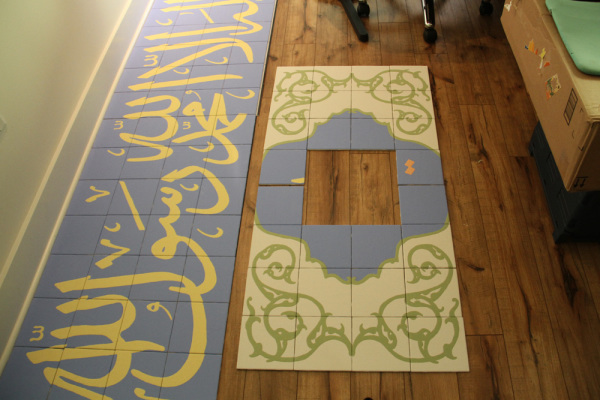 The creation of calligraphy tiles in and outside the building is a chance for such a creative contribution. For this project, Shirinbab worked closely with American Muslim Association administration to assess their needs in terms of the space and its relation with the community and neighborhood it is located. He devised a comprehensive plan envisioning how to bring calligraphy pieces through panels of traditional tiles, glass works, and murals to the outside and inside of the building. 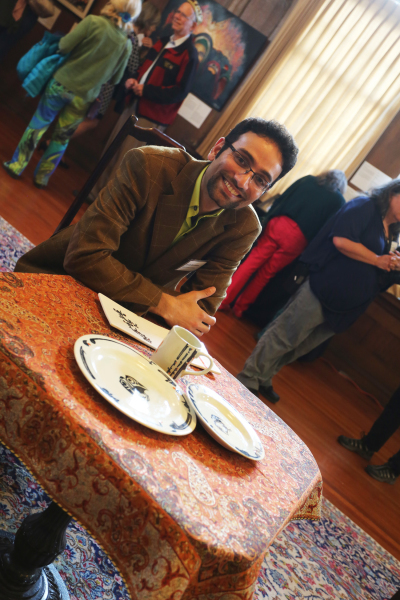 The goal was to open a dialogue between the building and attendees and to build artistic pieces that would talk about Muslim culture and identity while adding to this society. Shirinbab designed three panels for the entrance of the building and inscribed calligraphy pieces and decorated it with floral designs, as central piece of Islamic art element. 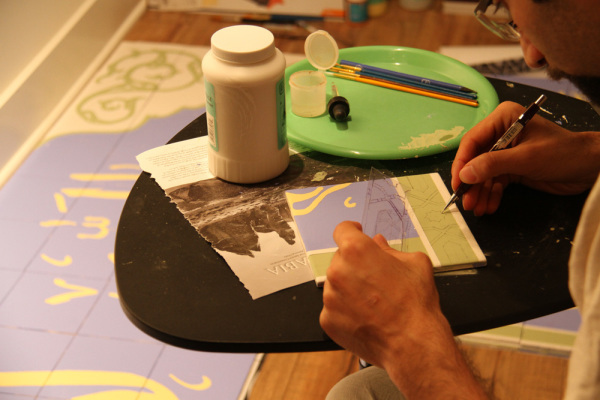 He finally hand-crafted the tiles, glazed them, and fired them in collaboration with local studios.